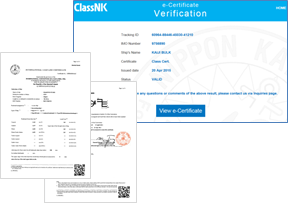 ClassNK e-Certificate issues and provides Full-term (Final) certificate(s) of Class, Installations Registration and each Statutory with Secured Electronic file (PDF) in place of traditional paper certificates. The service offers the following features and is compliant with the IMO FAL guidelines (FAL 5/Circ.39/Rev 2). Please refer to the pamphlet below for more details. For authorized status of Flag States other than above list, please contact the Classification Department (Certification Section). Please review the below frequetly asked questions. To apply for this service, complete the "Application for ClassNK e-Certificate Service", and send the application to the Classification Department (Certification Section).